I am currently on Holiday in Turkey until the 4th JULY. This is a scheduled post, Although I will be blogging while I am away, I won't be reading and replying to things until I return to the UK! Hope the weather is not too bad! Taking four pairs of sunglasses might be excessive to take on Holiday for two weeks. But Im a big believer in the fact you really do need to protect your eyes from the sun. I wear them constantly on holiday for a variety of things including the fact I get really bad hay-fever and at the end of the day I'm just one big diva (cough cough no makeup, look terrible). Make sure when your looking at Sunglasses check they offer good protection for your eyes! Sunglasses are supposed to protect your eyes from the harmful UVA/UVB rays that the sun gives out so it's SO important to get ones that offer adequate protection! For more information on sunglasses and eye protection see here. I suit sunglasses that are either round or have a slight cat eye to them. I think it's really important to find sunglasses that suit you face shape rather than ones that are the latest "trend"! My favourite pair of sunglasses has to be my Girl Props Half Tints I've had them for years now and they are my favourites to wear. Probably more a fashion piece than ones that are going to protect my eyes (although they do have UVA/UVB Protection, they are awkward to wear!). The green Primark pair is one of my all time favourites too, I've had these for around 2 years and still going strong. I bought them in the sale but I'm sure they've been re-released. I've pinched one pair off my Mum but Im sure I'll get them taken off me once we get to Turkey! 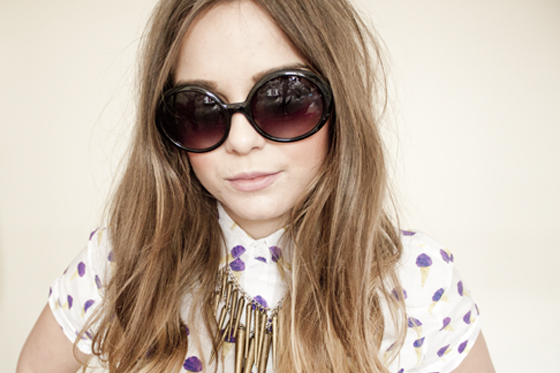 The River Island ones are recent additions to my Sunglasses collection, for a tenner they aren't too shabby! I really like River Island sunglasses although some of their offerings this year are slightly questionable! I'm probably also going to buy some Ray Ban Wayfarers at the duty free as I've been wanting some real ones for years now but never had the funds to get some! PS. Note from Holiday- My Girl Props sunglasses have actually cracked and melted in the sun, I've worn them in Turkey for the last three years and it's never happened before so I don't really understand why its happened this time! The weather was around 37C-ish at this point! These are awesome shades! I'm a huge fan of the rayban wayfarers. What a great sunglasses selection! I love the look of Raybans, but I'm so clumsy I know I'd break them as soon as I got them! Both the oversized shades and the polka dot blouse are equally cute on you! Those top ones are lovely! I stick to my Wayfarers a lot of the time, but I recently picked up a vintage pair of Sunrock shades. They're so cute, and not too pricey. I feel like you could pull of the slightly cat-eye shape they have! Also, I'm doing a small give-away on my blogt his week, stop by if you can! The first ones are cool, they remind me of some I've seen the Olsens wearing at a Chanel show. 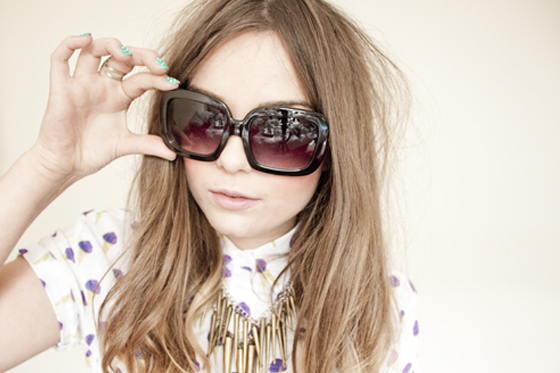 I wish I could wear oversized sunnies, I'm too attached to my Ray-Bans! 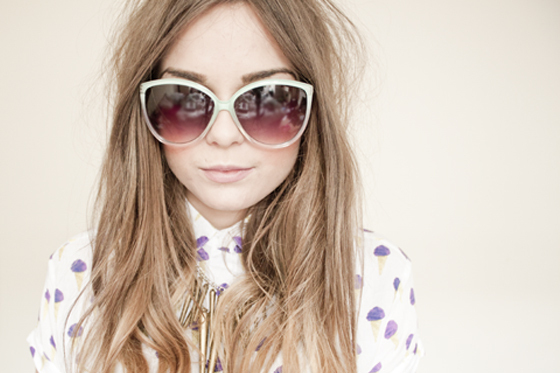 Love your sunnies! Makes me realise I need to branch out. I usually only have my Ray Ban aviators and wayfarers and a few pair of cheap wayfarers-like for festivals and messy holidays when I know they won't make it back! Hahaha! I've got the Primark one's too, friggin' love 'em! AND only 50p in the sale - for real! I love the 2nd pair, they look almost vintage! Hope you're having a great holiday, loving your instagram photos. Hi Lily, where is your necklace from? I've been looking for one like that for ages! Was it from H&M? I remember seeing someone say they had one from there but not sure if it was you. Hope you're having a lovely holiday, seems like you are from your pics! That first pair are amaaaaaazing! I love all these! Especially the first pair... It may be my next purchase! Love the first pair! Ive never seen any sunglasses like that. I have a sunglasses obsession and love Primark,, especially as I break them so easily! Check out http//stylegodis.com för great dels and shopping! Gorgeous, I love all of your sunnies! those first ones are amazing! you can go to Sunglasses. Over sized sunglasses fits the shape of my face, it looks so light and trendy. I really love wearing this that I have 2 pairs of Ray-Ban JACKIE OHH II Edition over sized sunglasses.